I love going to Ikea, but one thing that really upsets me is that the infamous Ikea meatballs are not gluten free. Everyone always raves about how good they are, so I decided enough was enough! 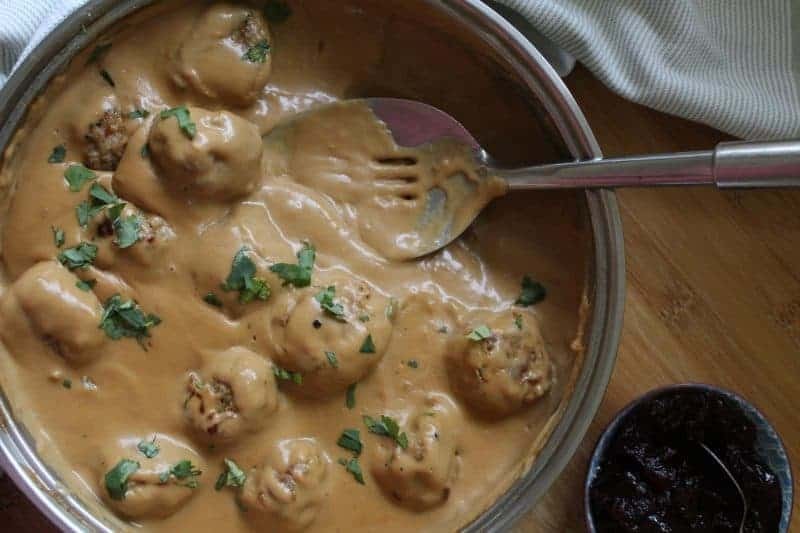 I set myself on a mission to create a gluten free version of the Ikea meatballs I longed to try. And now, several months and dozens of meatballs later, I think I’ve nailed it. 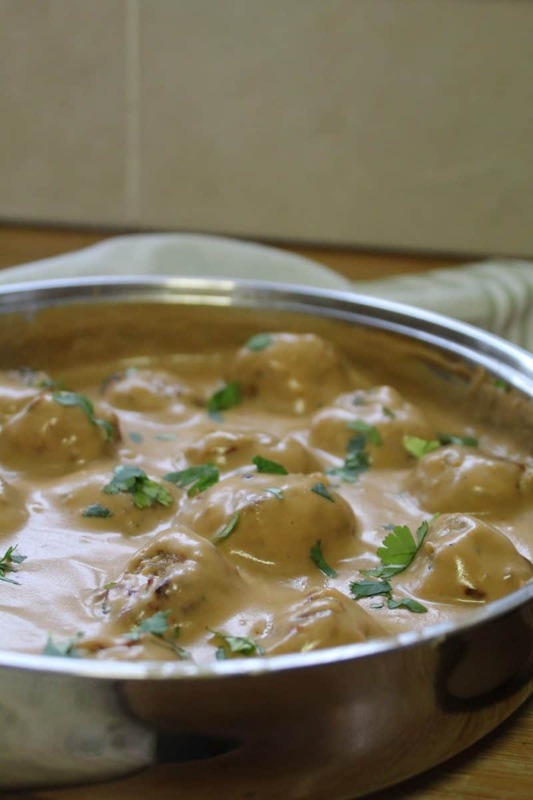 This Ikea meatball dupe recipe has been a labour of love, that’s for sure. Through blogging for many years, I’ve learned the value of recipe-testing to make sure all the recipes I bring you are spot on. But I think this might the one gluten free recipe I’ve tried the most! We’ve eaten gluten free meatballs once a week pretty much since November, so that just shows how much I wanted to nail these! 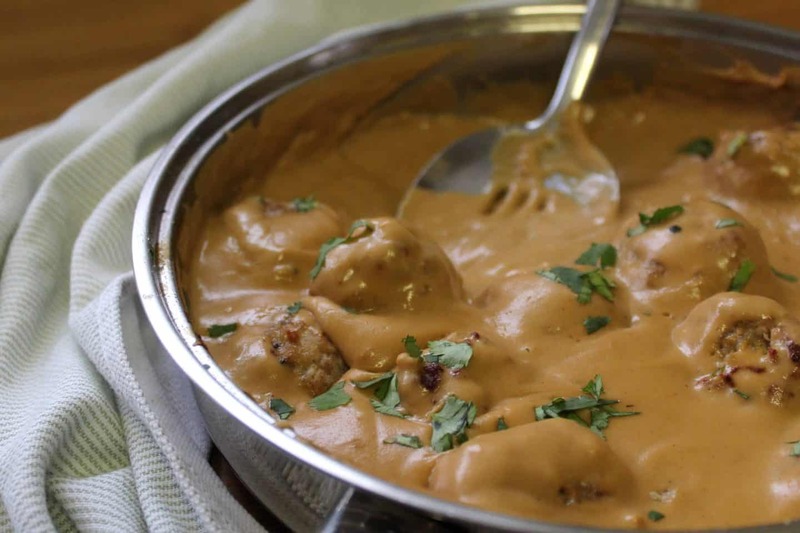 The theory behind the infamous Ikea meatballs is a pork-based meatball in a thick and creamy gravy. It’s served with mashed potato and a side of ligonberry sauce, though I used some cranberry sauce leftover from Christmas and the combination was INCREDIBLE. As I get older, I’m starting to really love fruity flavours in savoury dishes. It used to be something I detested but now I absolutely love it. There’s something about the creamy, rich sauce which is truly balanced out by a hint of sweetness. Finding the right ingredients for the sauce was really key. A lot of Ikea meatball recipes I found online used a thick, double cream, but in the end I got the best result from crème fraîche. It has all the creaminess, but it’s not as heavy. Ideal, because it means you feel you can eat more! Find a good beef stock for the recipe is also important. You could make your own, if you’re feeling really intrepid, by boiling beef bones for many hours. You could also, if you’re not feeling so adventurous, use a beef stock cube such as Knorr (see my guide to gluten free stock cubes here). I opted for the lazy option I’m afraid, with a tub of ready-made beef broth from Sainsbury’s (I found it with the beef and the chilled gravies). I found this gave the best flavour and I’d recommend you try it if you’re giving this recipe a go. 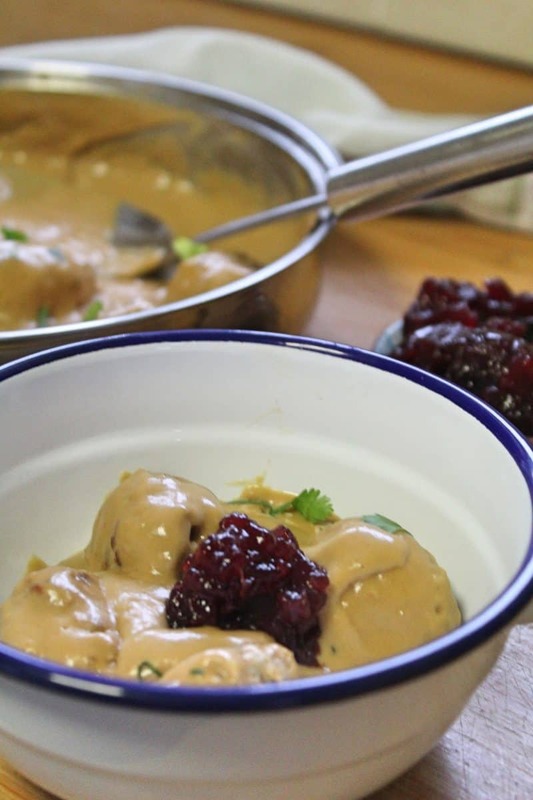 So if, like me, you’re feeling left out after an Ikea trip, give this recipe a try! 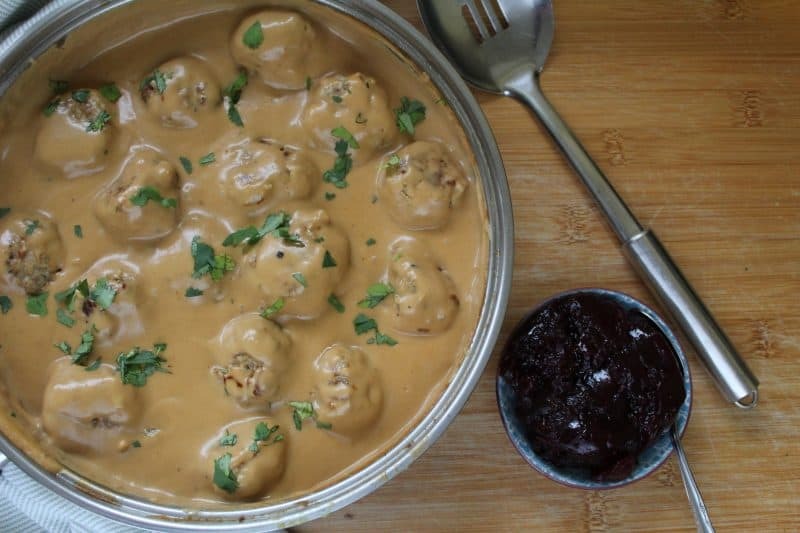 I’ve never had Ikea meatballs so I can’t compare, but I’m confident they’re pretty close – if not better! Feed them to the gluten-eaters in the house and see if they can tell they’re gluten free! Preheat the oven to 180'C and set a baking tray aside. Add the butter and olive oil to a large pan and heat until the butter had melted. Add the meatballs to the pan and fry on a med-high heat, turning until the balls have browned on the outside. Transfer to the baking tray and place in the middle of the oven for 15-20 minutes. Set the pan aside - you can use this for the sauce and keep all the lovely flavours from the meatballs, so don't wash it up! Melt the butter in the pan, and once melted add the gluten free flour. Stir and cook for around 1 minute. Slowly add the beef stock, crème fraîche and water to the butter/flour mix, whisking until it forms a smooth, thick sauce. Bring to the boil then turn down to a low heat. Add the Worcester sauce and mustard and season generously with salt and pepper to taste. When the meatballs are done, remove them from the oven and add to the sauce. Stir gently to ensure they are coated. Sprinkle with chopped, fresh parsley and serve with mash potato (or rice if you prefer) and some cranberry sauce on the side. Need some more gluten free meal ideas? I honestly had no idea that Ikea had meatballs lol. Shows you how much I know I guess!